Symposium cancelled Thursday, Februrary 22, 2018, due to winter weather. 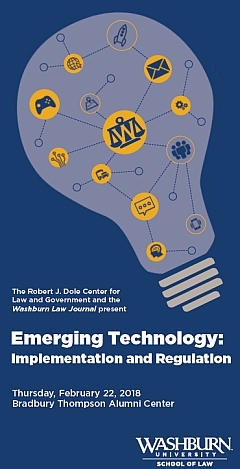 Washburn Law's Robert J. Dole Center for Law and Government in partnership with the Washburn Law Journal are pleased to host "Emerging Technology: Implementation and Regulation." The symposium will be held Thursday, February 22, 2018, at the Bradbury Thompson Alumni Center on the Washburn University campus. Free parking is available south and west of Bradbury Thompson. Agencies are facing a bigger workload than ever before, and they are increasingly looking to technological solutions to meet that need. This panel will discuss which tools agencies have already implemented and those they will consider for the future, along with issues of enforceability and discretion that are inherent in these new regulatory processes. Emerging technology offers an attractive opportunity for municipalities to upgrade the amenities they offer to their citizens, such as transportation and internet access. Achieving such goals, however, requires careful collaboration between local government and businesses, mindful coding and structuring of the new technology, and synergistic efforts between the different city initiatives. This panel will weigh in on best practices and useful advice for cities wishing to embrace technology for their citizens. This panel will focus on the feasibility, legal landscape, and the government’s role in the emergence of driverless cars. What will the next generation of semi-driverless or fully-driverless vehicles look like? Who will be primarily liable in the event of an accident? How will the laws of the road adapt when vehicles no longer look or operate like cars of the past? Panelists are invited to address these concerns and raise others that are not as readily apparent in the current regulatory framework. There is no charge to attend. A box lunch is provided to those who pre-register by Monday, February 19 at 9 a.m. (we are not offering specific dietary restriction accommodations though lunch will include a vegetarian option). Washburn Law Journal, volume 57, issue 2 (spring 2018), will be dedicated to the topic of this symposium, and articles written by the participants will be featured. Participants are encouraged, but not required, to submit an article, essay, etc., to take advantage of this opportunity for publication. Authors who cannot attend the symposium, but would like to submit, will also be considered for publication in the Journal. Inquiries about publication opportunities in the Washburn Law Journal should be directed to Jordon Dillon, Editor-in-Chief, at jordon.dillon@washburn.edu. View symposium brochure (1.8 MB PDF) (requires Adobe Acrobat Reader).